One in three college students doesn't get enough to eat. Schools such as Carnegie Mellon University have opened food pantries to help students in need but agree that it's only the start. To tackle the growing problem of food insecurity on college campuses, Integrated Innovation Institute students partnered with interdisciplinary students from across the United States to develop new solutions. Graduate students from the Integrated Design Innovation (IDI) Consortium's founding programs — Master of Integrated Innovation for Products & Services at Carnegie Mellon, MIT, Northwestern and the University of Pennsylvania spent four months analyzing food insecurity before presenting their findings and solutions at a culminating event this February. Now in its fifth year, the annual IDI Challenge unites students from four cross-disciplinary graduate programs to solve large-scale social problems. Students conducted primary research on how food insecurity affected their universities and local communities. "It's a huge problem that takes a long time to become intimately familiar with," said Brian Xiao, who is graduating with a MIIPS Advanced in May. He explained that the negative stigma of food insecurity made research more challenging. "The negative stigma was so great that we couldn't find people to interview: we put up signs, we digitally advertised, but nobody wanted to talk to us, nobody wanted to say 'I don't have resources for food.' That colored our experience and was the first thing we focused on when crafting our solution," Xiao said. After students presented their research in early November, faculty advisers from each school identified topic areas as part of the campus food insecurity problem. From there, students chose topics of interest and were sorted into cross-disciplinary, cross-university teams. Ellen Ayoob, the faculty adviser from the Integrated Innovation Institute, said students spent December and January familiarizing themselves with current food insecurity programs and interviewing key stakeholders before deciding on two or three possible ways to address their topic area. 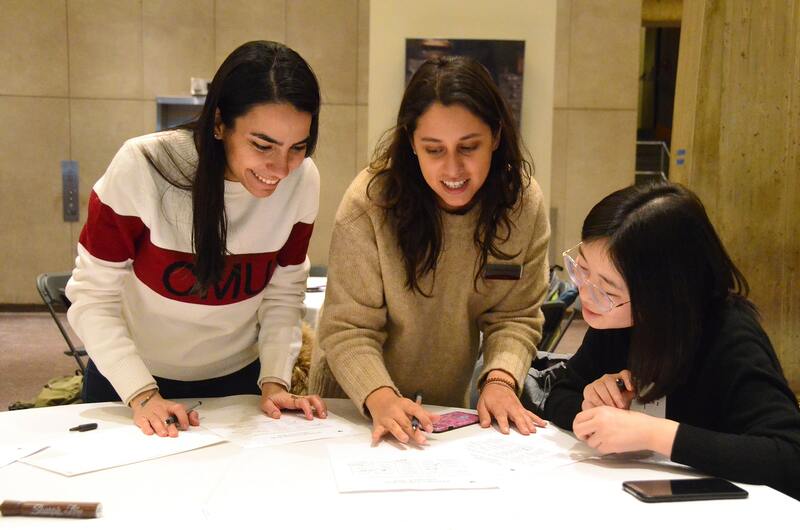 Zeynep Olcer and Lingzhi Li, students in the CMU's Master of Integrated Innovation for Products & Services program collaborate with a teammate from MIT. The challenge culminated at MIT's Cambridge campus in early February. Student groups presented their ideas and narrowed their focus to one concept based on faculty adviser recommendations and feedback from the food bank network Feeding America. Students spent all of a day prototyping and iterating their concepts before presenting a final solution to faculty advisors, fellow students and food insecurity experts. "I'm a car designer, so I wanted to draw something shiny like an autonomous truck that acts as a food pantry on wheels," Xiao said. He and his team built a moving food pantry with a locator app to improve campus accessibility. "We didn't have access to an autonomous truck, but we did have a bicycle. Within an hour, we built a little trailer, stuck a logo on it and collected food from catering." Xiao and his team tested the prototype and documented their findings, riding across MIT's campus and sharing free food with students. With the stigma of food insecurity at the forefront of their solution, his team prioritized the notion that all students should be fed, regardless of whether they were food insecure or just looking for a quick snack. The team played ice cream truck music as they rode through common areas, delighting students and passing out free cookies. By collecting foods from catered events, the team also hoped to cut back on campus food waste. Xiao credits his newly developed business acumen to the skills he's gained over the course of the MIIPS program. "Usually during hackathons and challenges, I'm the designer. I do the slide layout, I do the drawings," Xiao said. "I didn't do that this time. I ended up being the business person, which was something I would have never expected myself to do." 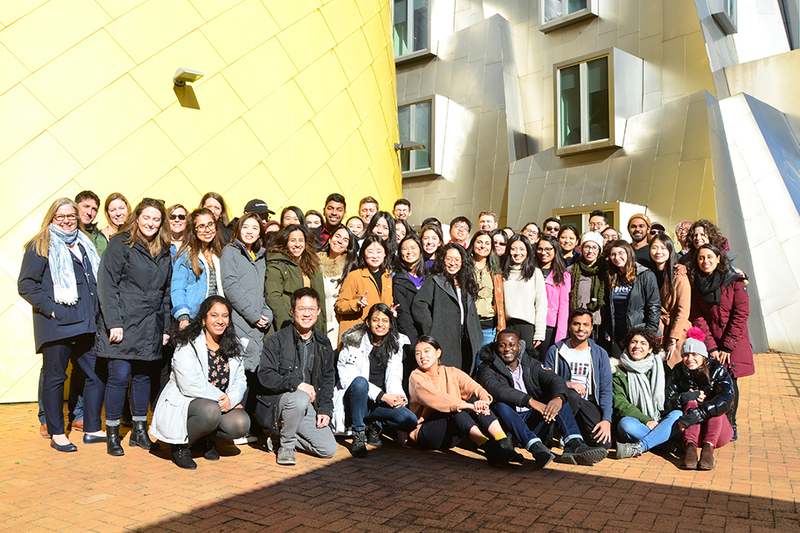 Students from Carnegie Mellon, MIT, Northwestern and the University of Pennsylvania spent four months analyzing food insecurity and findings and solutions at a culminating event earlier this year. Unlike other design challenges, the IDI Challenge wasn't a competition. Rather, students collaborated, inspiring new ideas and gaining valuable insight from each other. "We were building off each other, it was really open. In other hackathons, you're just doing your thing and you don't want other people to see what you're doing," said Harshika Jain, who is graduating with a MIIPS Advanced degree in May. Jain's team designed communal kitchens for campus spaces. "We were focused on really solving this problem of food insecurity. The experience was really collaborative until the very end." After the Challenge, MIIPS students have applied insights from their experience to their academic work. "We made a campus map in our Internet of Things class that shows the food pantry and all the campus buildings. When food is available in a building, the building lights up and you get a Slack message with the floor and room number," Jain said, explaining how the research from IDI has influenced her final project for Designing for the Internet of Things. "We hope to make this project big and have maps across CMU." "My team was great," Xiao noted, saying he learned a lot from his IDI peers. "Chris from Northwestern knew how to craft a story while Samip and Ameneh from MIT were really technical-minded. Though we all study the same thing, we all approach problems with a different style." Next year, the IDI Challenge will be hosted by the Integrated Innovation Institute in Pittsburgh.